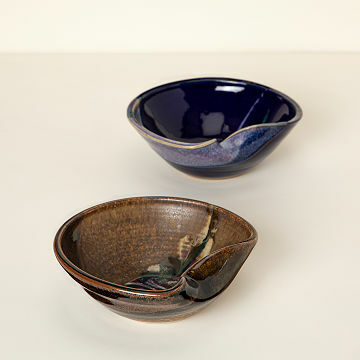 This handmade bowl features an ergonomic design for an elevated snacking experience. This ceramic bowl's thumb grip makes eating your favorite foods so comfortable, it's almost impossible to believe that the design started as an accident. While designer Bruce Larrabee was throwing a traditional bowl, his hand slipped and created an indent and fold on one side. Rather than starting fresh, he fired up the kiln like normal, added his signature bold glaze, and the rest was history. Enjoy popcorn, ice cream, or your favorite snack in this "happy accident" that blends functionality and art, and allows you to move from table to patio with ease. Handmade in Park City. 8" L x 7" W x 2.75" H; 20 fl. oz. capacity; 0.75 lbs. The quality was beyond what I could have expected. It is pretty enough to display. This was a gift to my SOs mother as a TY for allowing us to stay in her home for a week while we were on vacation. My hope was the misshapen bowl would be easier for her to grip as she has severe arthritis. I personally didn't see the bowl as I had it mailed to her, but her thank you note said it was a truly lovely bowl. Very lovely looking bowl, it stands out on its own. I would buy this product again. This time for myself! The recipient of this gift eats ice cream or cereal every evening. I know he's going to love this bowl! I have loved the style and work of Bruce Larrabee. This bowl is a contender for my favorite from him. It goes well his plates and bowls (or any other tableware) looks great for our fancier nights to our everyday meals. Fits well in both a medium to large and a smaller handed person. Great for a go to counter top bowl. Have been mixing up and/or serving something in it everyday since it arrived. Definitely a good buy for pottery lovers, cooks, and anyone how has or wants to appear to have good taste. It's beautiful and perfect for couch eating! I use it most often for scrambling eggs or a small batch of pancake batter.